This is an ongoing series where I’ve asked trusted people who have served God faithfully to write about a Scripture passage that has been of great significance in their life. The simple idea behind a “Treasured Text” is for you to be able to hear stories from real people, doing real ministry, and the real truth God has shown them. My hope is that their stories and Scriptures will challenge, convict, encourage, and strengthen your faith. This writing is from Jerry Canupp. Jerry is the Pastor at Mayfield Park Baptist Church in San Antonio, TX and you can follow him on twitter (@jcanupp), facebook, or his blog (jcanupp.wordpress.com). I’m telling you right now….this is a great writing! I pray you are encouraged and challenged. For various reasons, I grew up hungry for approval. I desperately wanted to be liked – accepted. I would perform for whatever group was on my radar – playing their game with the hope that I would be rewarded with a place of acceptance in the group. Little did I realize, all those years ago, people are fickle and capricious. I became a slave to the ever-changing standard of what it took to be “liked”. I think that’s the reason Romans 8 means so much to me. I love the way the chapter begins, “There is no condemnation for those in Christ Jesus…” I love the way Paul closes the chapter as well. Nothing can separate us from the love of God in Christ! It’s a beautiful, encouraging chapter. But, it is an obscure verse in the middle of that chapter that rocks me. This little verse means so much to me – a reforming approval junkie. It begins with a negative component. It tells us what we have not received, in our relationship to God. We have not received a “spirit of slavery”. The Greek word for slavery is “douleia”. It is the state of man in which he is prevented from freely possessing and enjoying his life. Jesus declared His intent was that we “may have life, and have it abundantly.” (John 10:10, NASB95) But there is no life for a slave. A slave, in this context, is bound by chains – specifically, bound by chains of fear (“…slavery leading to fear again…”). But fear of what? Fear that his performance will not be quite good enough. The approval he seeks after with his is never sure. In fact, in the case of winning God’s approval, he is lost. I have met a lot people who believe they can win God’s approval the way I tried to win the approval of people. “If I perform a certain way God will approve of me – like me.” Many would even say that God’s approval is easier to win than that of people because He is not fickle or capricious. They say things like, “Only God can judge me” …thinking somehow He will wink at behavior or understand how hard a person tried or the intentions of the heart, and everything will be OK. Many people would really rather not think about it, because when they do they are afraid that their performance may not measure up. That’s where I was (I think a lot of people are in that same place); either in denial (choosing not to think about it – and acting as if approval doesn’t matter) or outright slaves (constantly performing for the approval of man or God – and never really knowing if I’m good enough). It’s the spirit of slavery (performance for approval) and it leads to fear. At this point, you are probably thinking I wove all this together to share the Gospel: God loves me and created me for Himself, yet my sin and rebellion separate me from Him. There is NOTHING I could ever do to repair the breach between God and me. Yet, because of His love, God bore flesh and lived the perfect life required of me and then died to pay for my sinful nature deserves. He then rose from the dead to prove He, being God, had conquered sin and death. …and everyone who trusts in Him alone receives the gift of forgiveness and eternal life. And, if you have never heard this amazing message and responded to it, YES, I invite you to trust in Christ. I am so grateful that my sin is forgiven. Honestly though, my assumption is that you have responded and are grateful for God’s grace as well. No, my primary reason for writing this is because, even after I knew I was going to heaven, I still had “does God even really like me” issues. You see, I knew God forgave me – I knew I was going to heaven. But my understanding of that truth lead me to a deeper slavery. Because I saw that God only tolerated me, but didn’t really like me. I mean, He couldn’t really approve of me the way did other people I knew; those “Super Christians” who looked so good to me. My pastor, the leader of a Bible study I was in, preachers on the radio… or especially Bible heroes like Paul. I was the filthy step-son at best, in my mind. So, I tried to fix it. I put back on the very familiar chains of slavery and began modeling my life after one of the Super Christians I admired. Now, there’s nothing wrong with having role models or adopting the example of other Believers; but I was comparing myself to them and assumed God was also. I wanted a worn Bible like this guy; wanted a prayer language like another, memorize this book of the Bible, use the vocabulary of radio personalities… all in an effort to be “liked” by God. There I was. A child of the King wearing the chains of a slave – constantly afraid that I was doing enough… wasn’t good enough. Can you relate to that? 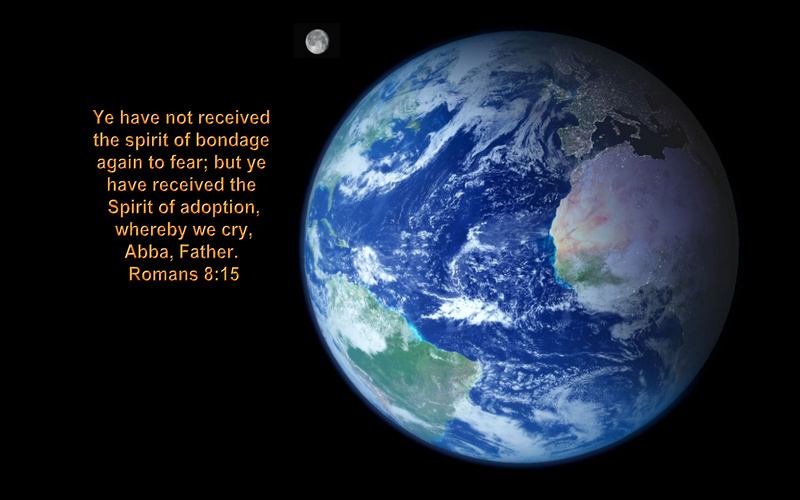 Romans 8:15 says that God doesn’t give us that sort of “spirit” …slavery that leads to fear. Instead He gives us the spirit of adoption. ADOPTION! …and not just adoption, adoption as sons. That’s not a gender designation. It is a position of relationship – acceptance. God has accepted me into His immediate family. What’s even more, this “spirit of adoption” brings me into position to call God Abba. Abba is an endearing term for a father in Hebrew culture. It is much like the term “daddy”. My kids all call me Pops. I chuckle even as I write it down – I honestly don’t know how they arrived at that or who started it, but I love it. I love to hear my kids call me Pops. It is so much more than simply my “nickname”; it communicates their special relationship with me. I know it’s special to them, I’m sure. But that name has deep channels into my heart. While it would be weird to hear anyone other than my kids call me Pops, I had an experience not too long ago that surprised me with joy. My daughter-in-law used that special name with me – she called me Pops. At first it seemed strange – and then strangely comforting. Nikki is my daughter-in-law because she married my son, Eric. She is mine by virtue of her relationship with my son. Yet, I have a love for her than is hers alone. I love Nikki. She is my daughter and, while the relationship was made real because of my son, I love her with a love that is directly from my heart to her. She doesn’t have to perform or attempt to earn my love, or my acceptance of her – she has been given the status of daughter by virtue of my son. She is mine and I love to be called Pops by her. I don’t even begin to compare myself, as a father, to God. But I think I get a sense of the Father’s heart as I relate to Nikki. My relationship with God is absolutely because of and through His Son, Jesus Christ. He is my only righteousness and His righteousness is sufficient (2 Cor 5:21). I have always thought that calling God Abba was a benefit for me – something for me to enjoy without ever really considering God’s “feelings” on the matter (I probably would have thought He saw it as a necessary annoyance, to be honest). But Nikki has caused me to think about some things from a different perspective. If my heart derives such joy hearing her call me an endearing name, I can only imagine what the heart of God experiences hearing me call Him Abba – Daddy. There is no amount of personal performance that can allow that level of intimacy… or jeopardize it. So, this approval junkie has learned the value of acceptance by virtue of the Son. My relationship with God, though deeply personal and intimate, is not mine because of my performance. I have an “alien righteousness” that is permanently mine. I am free in my relationship; the Son has set me free and I free indeed. …free to call God Abba. Free to love and be loved. Free to try and fail. God loves me. If you are in Christ, He loves you too. This entry was posted on December 10, 2013 by Josh Humbert in Blogroll and tagged Adoption, approval, comparisons, Fear, Jesus, Romans 8.